One grandma, two parents, three young kids. That was the makeup of our multigenerational vacation in Rome earlier this year. 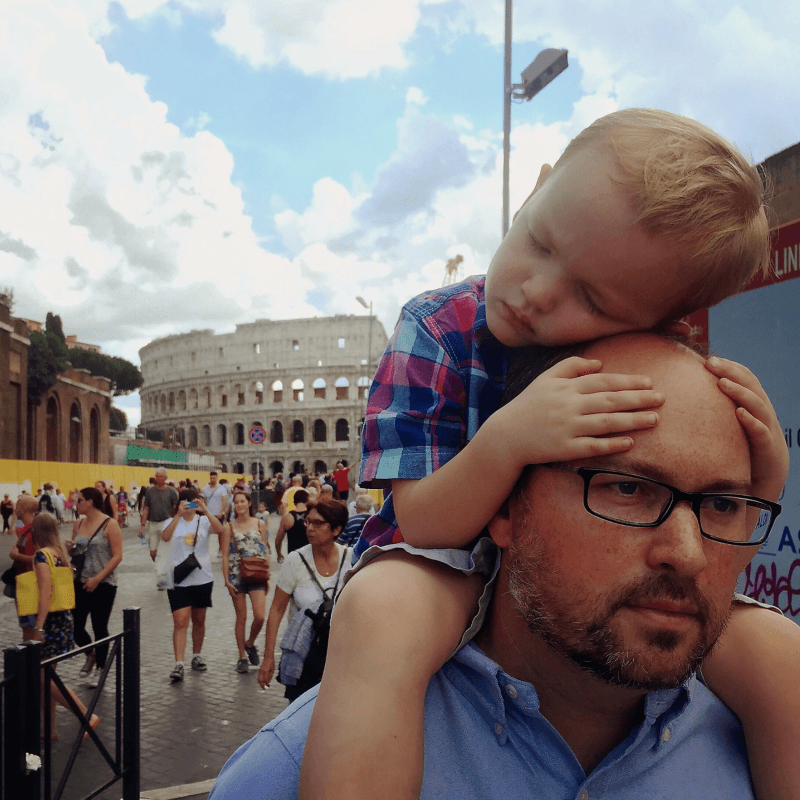 Despite being seasoned family travelers who knew our way around Rome back when my husband and I were newlyweds, we weren’t prepared for the nuances of traveling with multiple age groups. 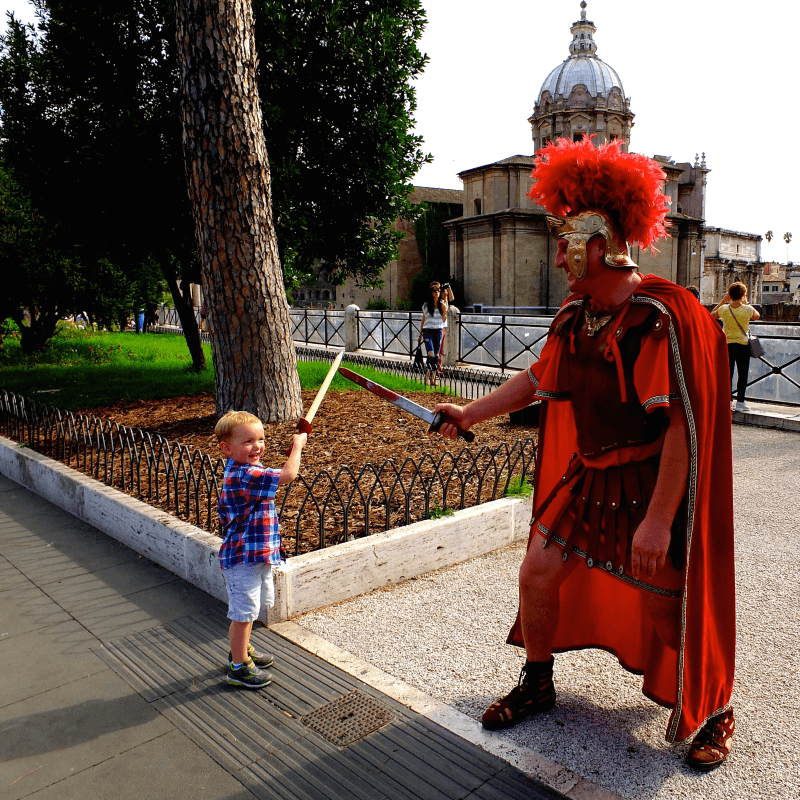 Here are four tips for getting the most out of Rome when traveling with three generations! 1. Splurge on accommodations to stay in the heart of the city. Do NOT choose a budget hotel or apartment “just outside” the center of Rome. Part of Rome’s charm is that so many of the great sights are within walking distance of each other. Young children and grandparents may not be capable of walking the entire day, so having a hotel in a central location is a necessity. A well-placed hotel allows for rests as needed and afternoon naps for any kids (or adults!) that need a break. 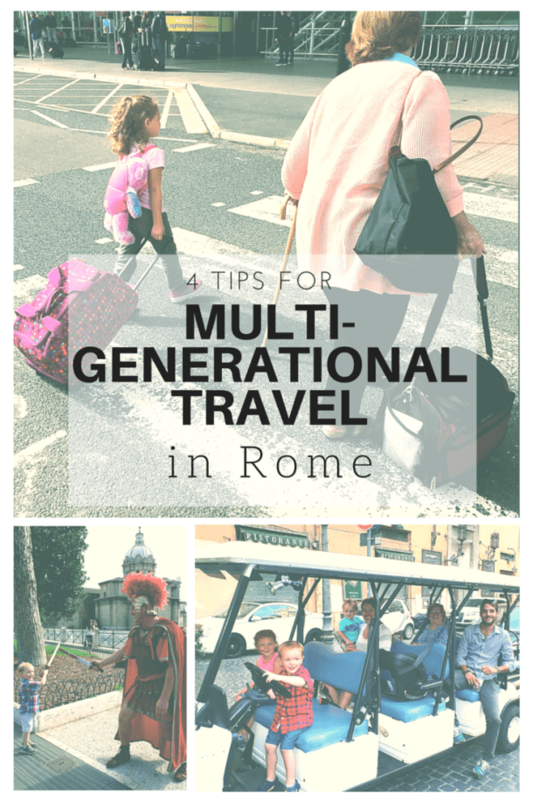 Embarking on a multigenerational vacation in Rome probably means you are traveling with a larger group. Taxi vans were hard to come by in Rome. If we hadn’t booked a car service in advance to collect us from the airport we would have been forced to split up and take two cabs. Selecting a hotel or tour company that will arrange airport transfers and transportation to any additional destinations around Rome is a life saver. While Rome boasts an extensive public transport and metro system, it may not be the best option for multigenerational families. Most metro stops are not handicap accessible. That means stairs—lots of stairs. Lugging a stroller and kids up and down stairs can make for a rocky start to a full day of sightseeing. Dreading the stairs and recalling the pickpockets from our last Roman vacation, we opted against public transport this time around. The best decision we made while in Rome was choosing a golf cart tour with My Best Tour. 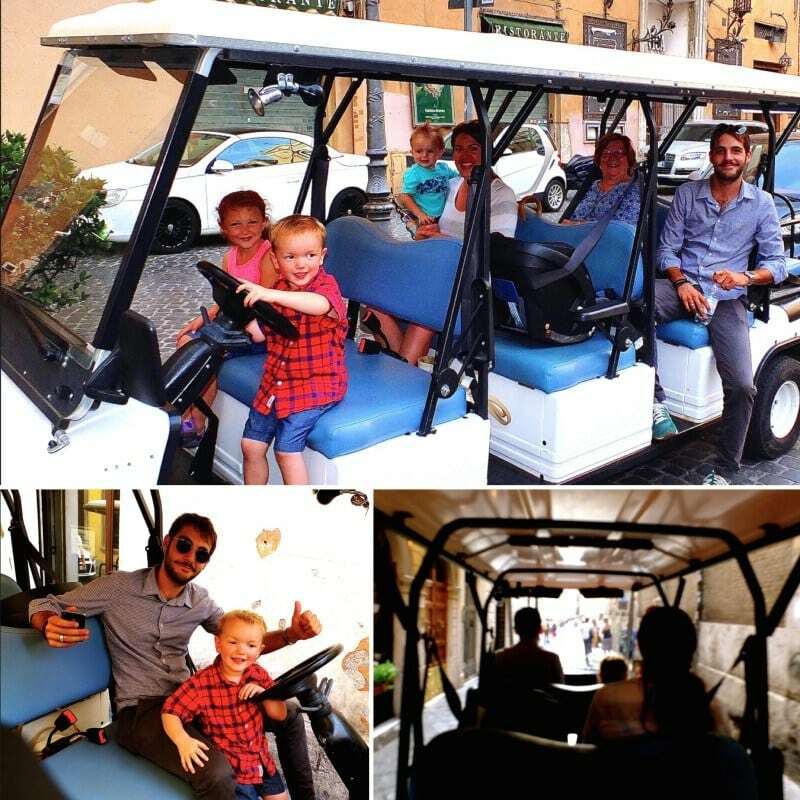 Our entire group fit comfortably in their extended golf cart and we were able to explore the narrow, winding alleys of Rome as if we were on foot, but without the hours of walking it would have entailed. The kids thought it was the most awesome thing ever. And our driver/guide was both knowledgeable and entertaining. It’s more difficult to be spontaneous when there is a whole group to consider. Book tours in advance that can accommodate your party. Did I mention it was still HOT in Rome in late September? Overheated adults plus whining children who’ve been waiting in the blazing sun for hours are NOT a good combination. No matter what time of year you visit, I recommend paying the extra fee or hiring a licensed guide so you can skip the lines at the Vatican or Coliseum. It is definitely worth it. A good tour guide’s knowledge-base extends well beyond history. Having a guide who could make the Vatican accessible for a grandma with bad knees while making it entertaining for my 3- and 5-year-olds was priceless. Walks Inside Rome have handcrafted a treasure hunt-themed Vatican tour for children led by their experienced guides. We toured the Vatican museums for three hours and my kids were still smiling and going strong when our tour ended. The best part? Months later they are still surprising me by randomly spouting off facts they learned. Hiring an experienced guide for the Vatican not only makes for a great learning experience but also can also help with the more practical issues of navigating such a vast complex with a stroller and titanium knees. Don’t be afraid to ditch the plan. That’s right. Have a plan, but know when to veer from it. Our best days were when we decided to forego our packed sightseeing schedule and take our time. We may not have seen every inch of Rome, but we were able to enjoy all of the major attractions at our own pace. And we discovered some great restaurants and gelato along the way! A multigenerational vacation in Rome provides a wonderful opportunity to spend true quality time with family and build lifelong memories. If you are mindful of the tips above and make a concerted effort to remain calm through all the unexpected hiccups along the way, you will be rewarded with the ultimate family bonding experience. 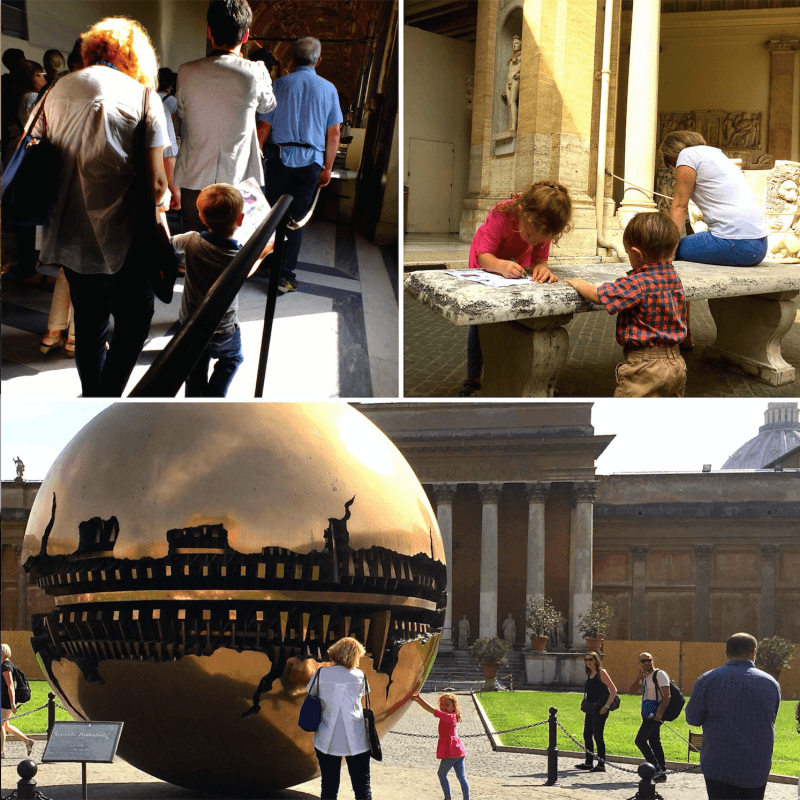 Would you consider a multigenerational vacation in Rome? Let us know in the comments below! A Note from The Restless Travel Mama: We received discounted tours with Walks Inside Rome and My Best Tour. All thoughts and opinions are my own, as always. I agree with the though of staying in a central location. Less walking for kids and older adults is good and worked out for us recently in Barcelona.